Some BIG news dropped last night. 343 is bringing Halo to YOU! This via a traveling exhibit called “Halo Outpost Discovery”. There is a lots to discover (see what I did there) here, so let’s take a look! Before I get started, let me say that the event name will be forthcoming. For now, I’m just referring to it as ‘the event’. Rest assured it will be a Halo-themed event. There is no pure Halo convention out there, that I know of. One or two may feature Halo prominently, but they are not purely Halo. This is a early post in preparation for next year’s HFFL event. Now normally, this is where I say it’s going to be a LAN event. Not this time! Nope! I’m planning on something MUCH bigger! I’m talking mini convention size, to start. I’m inviting all sorts of Halo communities to come to the event and set up a booth so that they can promote their communities. Along with that, there will be a full fledge FFA tournament. AND…a 4v4 tourney as well. For REAL money, not just prizes as I’ve had the last three years. To get this off the ground it’s going to take a lot of work and a good bit of funding. I’m going to need your help on this. I’m setting up a Kickstarter campaign to raise the funds for the event. I’d like to ask you all to not just take a look (and hopefully donate), but also pass the word along to all of your fellow Halo fans. 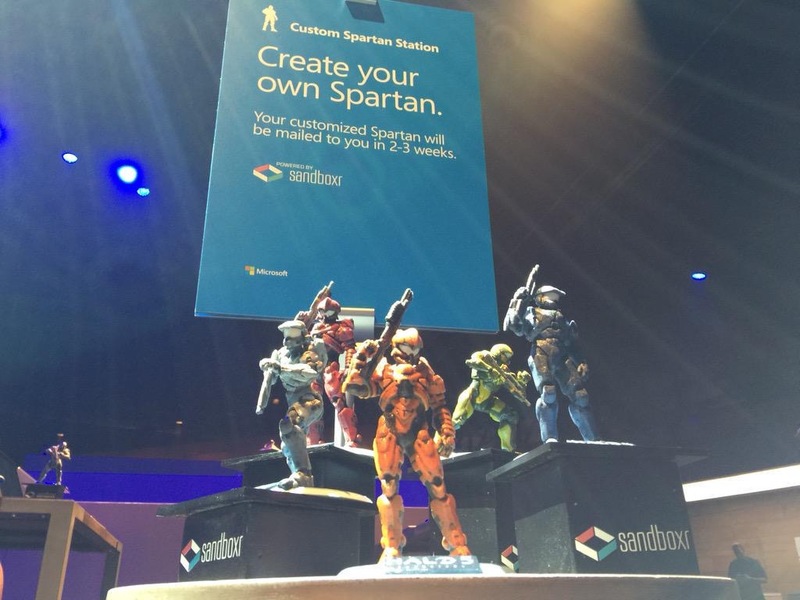 Folks at the Windows 10 event in New York got the opportunity to create their own Spartan. As you can see by the pic below, they’ll get them in a few weeks. Unfortunately, it looks like this wasn’t open to the public as an ongoing thing. Who knows though, maybe this will continue through New York Comicon? Wish I was there. I would SOOOO want to make one of these! There is just SO MUCH going on in this vid! And it all looks FUN! Are you hyped yet? The crew from Gamespot get to try the ‘real life’ Breakout map at SDCC. What I want to know is…where do I get one of those helmets, chest plate and shoulder armor??? 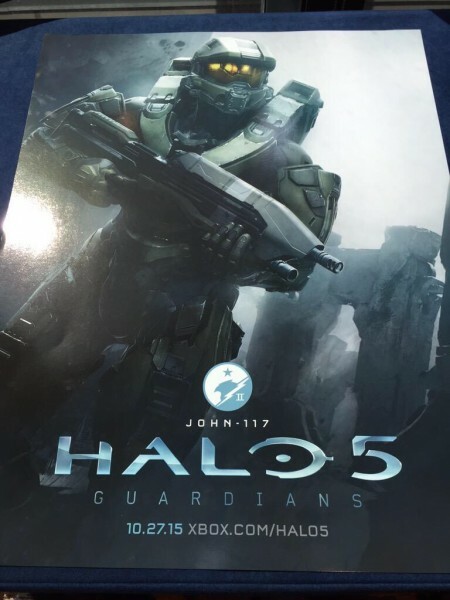 Che Chou of 343 tweeted out the following image of a new Halo 5 poster available at San Diego ComicCon. I’ve already reached out to him to ask if 343 will make this poster available on the Waypoint store. No answer to that yet, but let’s hope so. Or better comes to retail stores. E3 Halo expectations and wild conjecture! My expectation is Halo Wars 2. This has been only slightly hinted at by the current head of XBOX. If we do get a Halo Wars 2. I hope that it’s more like the E3 Demo vid that I posted the other day. The bases are modular instead of standardized to one play space. Since the original was earlier on in the Human-Covenant War, there are PLENTY more battles that can be shown and of course all new ones made up for this specific game. Today (as of this writing). there was a Halo voice-over panel at Momocon. Both Steve Downes (Master Chief) and Keith David (The Arbiter) were there. Click on over to the link for a more than an hour long panel. Start at the 9 min 40 second mark. My friend Krysta from Halo Podcast Evovled posted this on their fan page. I just HAD to share it here. 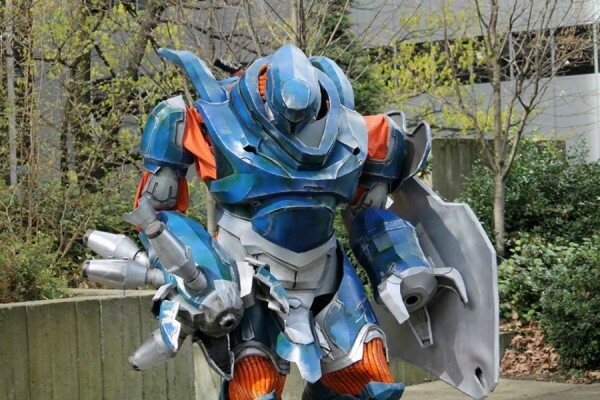 This cosplay is TO SCALE. At full height it’s 12 feet tall!!! Below are just a few of the pictures from the series of these. The link to all of them will be at the end of the article. These pics were taken at ECCC 2015. Posted in Conventions, Fan Art / Other non-written media. BloksFest Tickets on sale tomorrow! HFFL is going to New York Toy Fair 2015!!! I have the absolute pleasure to announce that we will be live in attendance at this year’s New York Toy Fair! I’ll be scouring the whole convention looking for toy manufacturers that have Halo licenses and bringing you pics and articles of what’s seen there! This is the second time HFFL has been to Toy Fair. The last time being in 2012. You can find those articles by typing “New York Toy Fair 2012” in the search field. Key vendors that I will be visiting will be Mega Bloks and McFalrane. There will be others though. If you have any particular vendors you’d like for me to visit (that have Halo licenses), PLEASE respond below or e-mail me at sal@halofanforlife.com. I’ll do my best to get to everyone of the exhibitors that has a Halo license and take plenty of pics. Look for me to live tweet during the event, with larger articles coming later in the day. I want to thank my incredible wife for booking lodging for us. We’re able to make this trip possible for LESS than $300 for the whole weekend. That’s freakin’ outstanding, considering New York prices. New York Comicon starts today! I am not in attendance this year, so I’ll be scouring the web for any Halo info coming from the convention. If you any Halo info from NYCC on the web, please let me know. Shoot me an e-mail at sal@halofanforlife.com. I know I’ll have some Halo Mega Bloks news to post.